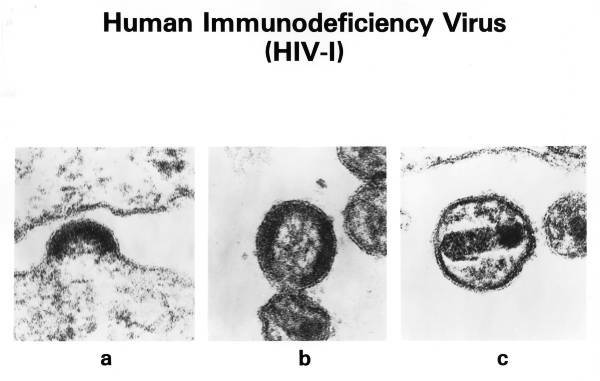 Three of the earliest visible stage of Human immunodeficiency virus (HIV) replication. It occurs when viral proteins accumulate under the cell membrane in a process called budding (a). In the next stage a crescent shaped early bud has constricted, forming a membrane-encapsulated sphere, with the dense center called a viral nucleoid (b). As the constricting process continues, the virus pinches off and becomes free extracellular infectious virus (c). At this stage, the dark circular mucleoid condenses into a bar; this morphologic feature is used to discriminate HIV-I from HTLV-II and HTLV-III.